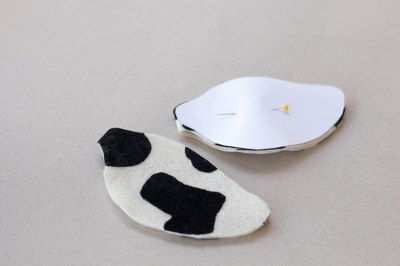 Whether your child is a cow in the Christmas pageant or is appearing as a cow in a production of "Charlotte's Web," she will need cow ears. 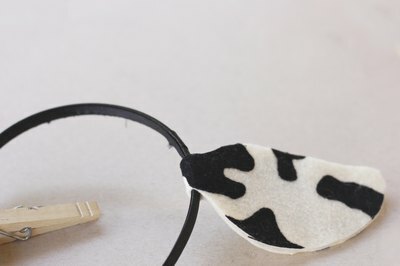 These ears are made on a headband base, so they are comfortable and will fit almost anyone. 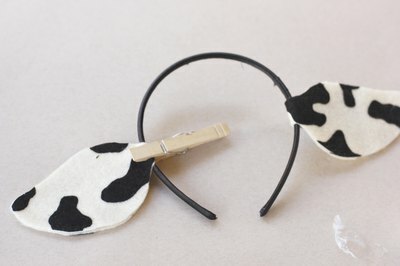 For example, use these ears to dress the baby like a cow if his big brother is going to be a cowboy for Halloween. 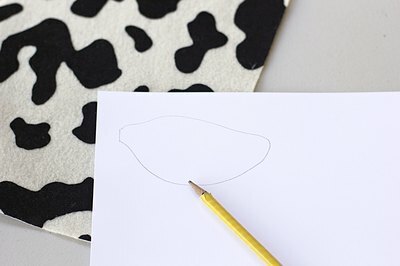 Draw a cow ear on paper. 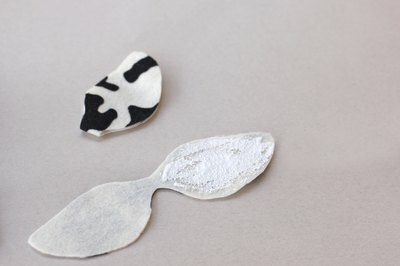 Cow's ears are ovals that are sometimes slightly longer at the top. Use a picture as a guide. For a child, make the ear about 4 inches long. Cut the shape out. This will be your pattern. 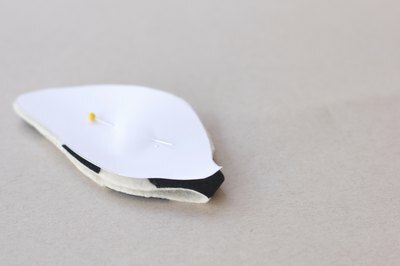 Fold the felt in half and place the pattern with the base of the ear at the fold. 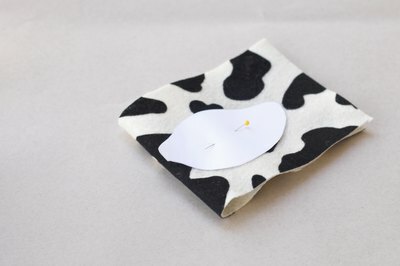 Pin the pattern to the felt. Start at the fold and cut around the pattern. End your cut back at the fold leaving about an inch along the fold uncut. You will have two felt ears joined at the base. Cut the other ear the same way. Spread a thin layer of white or fabric glue on one side of the felt. Wrap the felt ears around the headband on each side. 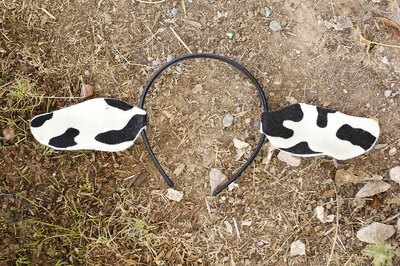 Cows' ears stick straight out from their heads at the sides. Glue the two halves of the ears together tightly to the headband, matching the edges. 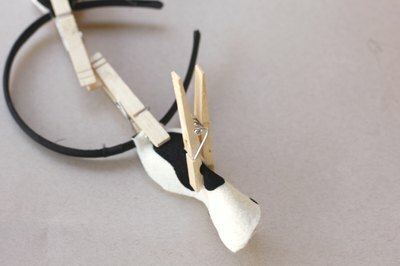 Use a clothespin to hold the base of the ears firmly against the headband until it dries. 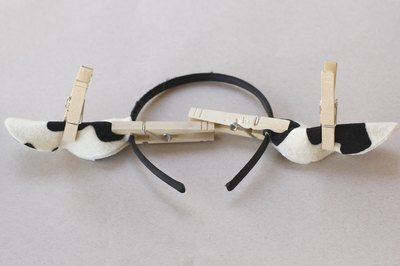 Use a clothespin to hold the base of the ears firmly against the headband until it dries. Shape the ears into a slight lengthwise curve while the glue is wet by pinching the back of the ear with a clothespin. You may also take few small stitches in the back of the ears at the base to hold them in a curved shape. Allow the ears to dry overnight.